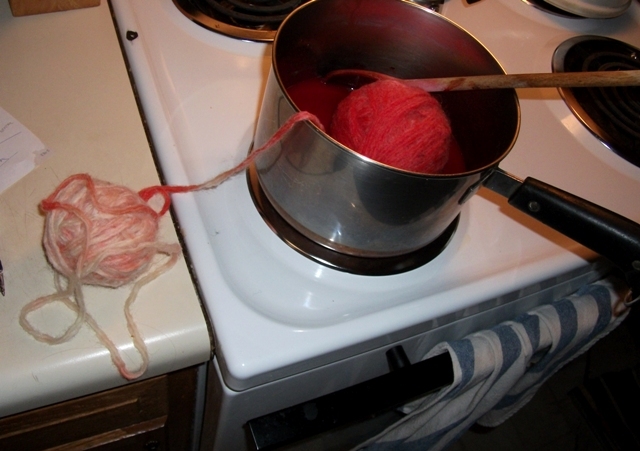 I’ve been wanting to start dying yarn for quite some time, but we currently lack the space, ventilation, and decommissioned cookware. So I finally got around to dying with the stuff you can’t technically die from, but I certainly wouldn’t want to ingest, though millions do. 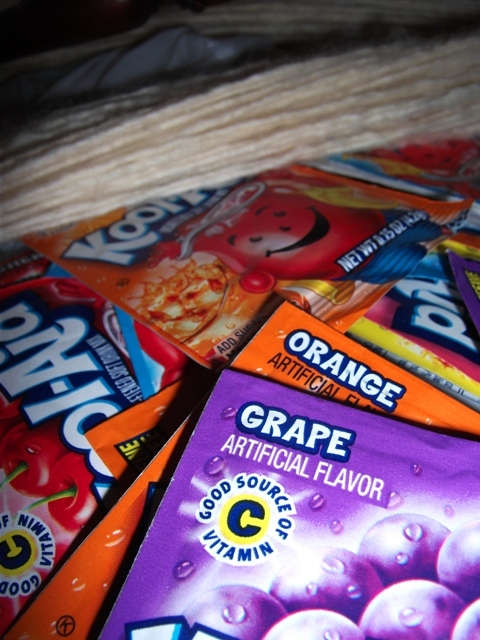 Yep, good old Kool-Aid – and I stand by my opinion that the stuff really is truly horrid, but I’ve been wanting to try gradient dying with this tutorial and it’s cheap and I thought readily available. * A [not so] brief aside about my relationship to the beverage – the only positive thing I can associate with it is its endearing camp name of “bug juice.” We always had bug juice at summer camp, though I don’t remember drinking it. Why? Because I barfed fruit punch flavored Hi-C** as a small child and have always carried the world’s worst aversion to the scent/smell/taste/whiff/hint of fruit punch (and bright red beverages to a lesser degree) into present day. In fact, that is partly the reason that my only fear in life is anything to do with vomit – both my own and others’, and the pile on the sidewalk, or the remnants in the bowl in a public restroom, or boats, or amusement rides, or pregnant women, or drunks, or babies, or children, or hospitals and doctors offices, or even the offhand comment by someone that her/his stomach feels a little funny, can send me into a tailspin of fear and trembling. The other reason is my second grade teacher had me clean another student’s puke off some wooden puzzles. I was above average for my redneck school, so I was off quietly reading to myself – an Encyclopedia Brown book in fact – when the teacher was conducting a reading lesson to the rest of the class. I was absorbed in my book, and didn’t notice what happened in the back and the subsequent sudden shuffle of students and a teary girl running out of the room. Then my teacher sweetly asked if I could help her, and being a generally obedient child, I did. Usually the teachers wanted to rub their excess hand lotion onto you (which seems mildly horrifying now), or help watering the plants, or straightening the [outdated] books. No, I was presented with a stack of puzzles covered in chunky upchuck and told to take them to the restroom (or maybe she called it washroom) and clean them off. I did. I think I cried. I think my mom raised holy hell at the school afterwards. But all I remember is the spilled stomach contents and it haunts me to this day. But back to the dye job. 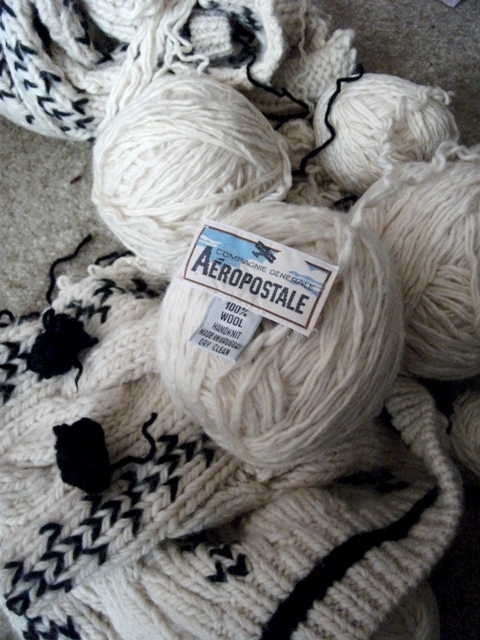 I started unraveling this thrift store sweater around the time we moved a year ago so I never finished it and have only recently found the box in which it was shoved. I hate to unravel something hand-knit even from a big company that most likely exploited the labor (though I have no proof of that so don’t sue me) but this was a late 1980s, early 1990s monstrosity with gaping drop shoulders that reached the naval. Maybe I killed something really important to fashion history – I killed it for its pelt. The wool is good – very sheepy. 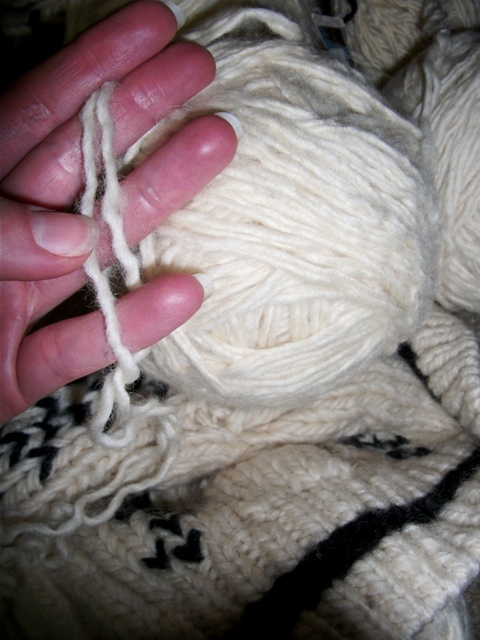 It was knit with two strands held together to make for a bulky weight – unplied you’ve got twice the yardage at a still generous worsted weight. I wanted at least 150 yards, so I wound off 100 thinking I’d go the worsted option and then have 200. I bought several packets of the evil drink mix, though I was disappointed that there was no green or blue – what about lime or blue raspberry (even though there isn’t such a thing as a blue raspberry on this good green earth)? 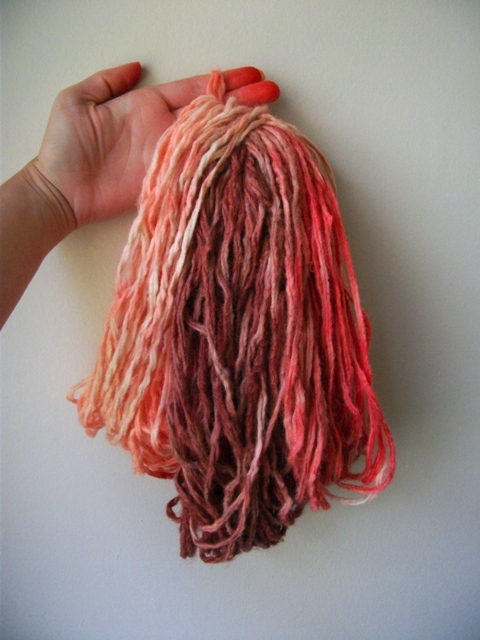 What follows are notes to myself that I’m sharing so use the tutorial or check out the What a Kool Way to Dye group on Ravelry for technical details. First bath was two packets of lemonade, and one of watermelon. The lemonade was basically useless as yellow, but it helped turn the pink slightly more coral. 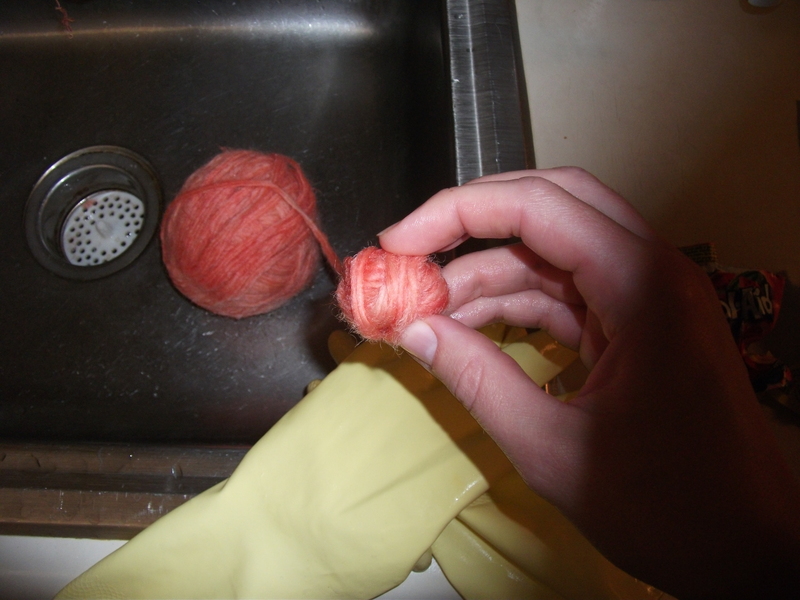 My ball was pretty dense and I was sure the dye didn’t get very far so I wound off all of the first color. Then I left it out of the pot and stuck the bigger remaining ball in. Second bath was a packet of tropical punch and one of orange. This is where I nearly lost it, and unfortunately only later found out that cherry is basically the same color and I never had to endure the fruit punch in the first place. I can’t even begin to describe the odor – artificial flavor and scent, wet wool, the sh*t that was stuck to the burner and burning, and the remnants of eau de thrift store. 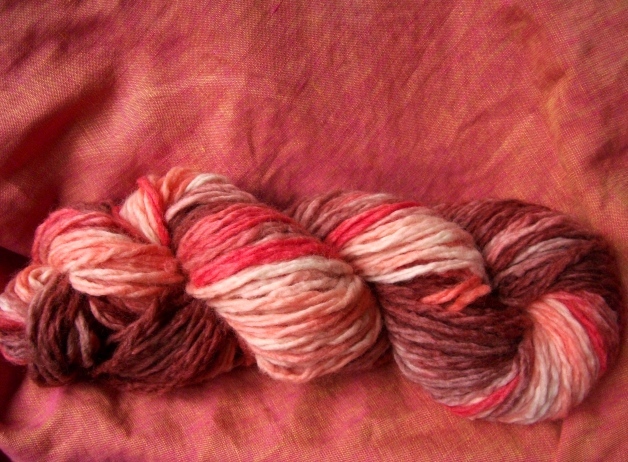 (The sweater had already been washed once but the yarn hadn’t had its second bath yet). I couldn’t take it for very long, so before the liquid had gone clear, I rinsed and wound this around the little pink ball so the last undyed layer was on the top. Then added one grape packet to the pot and sprinkled on another directly to the ball. It looks like mold. It smelled like hell. But the grape covered up the worst of the fruit punch stink. Then I soaked it a couple of times in cold water and vinegar. I hoped that the vinegar would help with the stink, and it did to a degree, but I’m still picking up a whiff I’d rather not. I don’t know the color fastness of the final product, and it’s faded a bit after drying, but I don’t mind if it fades a bit more. I suspected that the plies would felt and they did, so I’ll probably end up using this as 100 yards of bulky weight yarn. And yeah, wear gloves. I did except for the one time I really should have been (see top pic). *The fancy grocery stores that we as food snobs frequent do not stock the stuff, so I had to visit a grocery on the other side of the tracks to find it. But it is one that I will return to as I found lower prices on a few things I buy, and smaller sized things – though that is a crime – the smallest portion is always the most expensive in terms of the price per serving and the poor gets screwed with that, but for some things, I only want a little bit since I end up having to throw larger portions out. **Never give a child with a stomach ache anything that contains food coloring. 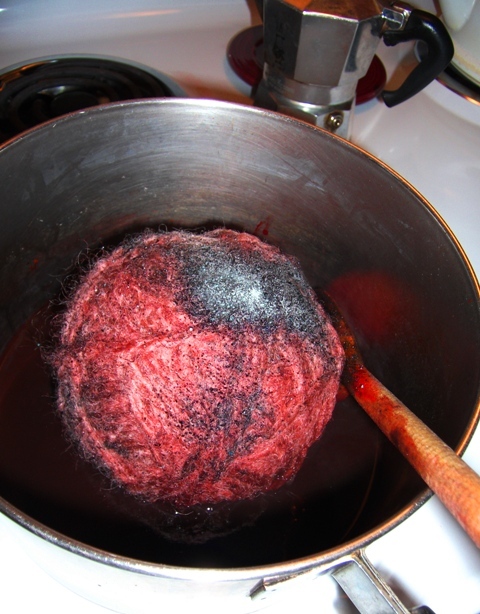 I wonder if the dyed yarn will still be a “good source of vitamin C”? Probably if you sucked on it long enough – you’d get some fiber too! Try easter egg dye next time. Great colors with no chance of vomit PTSD. Hey thanks for the tip!! !